Sea Glass .. What is it? Where can I find it in Barbados? 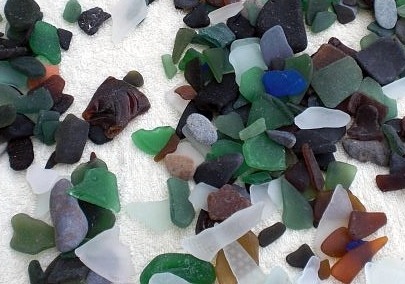 Sea Glass or beach glass are those colourful or not so colourful pieces of glass that you find rolling around at the waters edge. 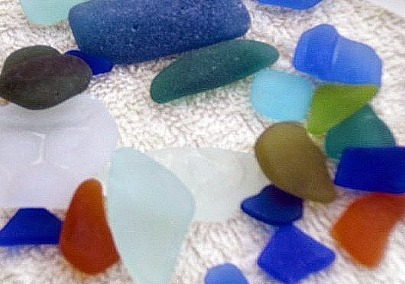 Finding sea glass in Barbados is very easy, the West Coast seems to have the best beaches for finding beach glass. These pieces of tumbled glass all began as, bottles, jars, windows or other useful objects that were discarded or fell into the sea. Of course all kinds of accidents and mishaps at sea also add to the amount of glass to be found. After many years of strolling the beaches in Barbados picking up interesting looking pieces and tossing them back into the ocean I came across a website that aroused my interest. I wanted to find out more about (mermaids tears) another term used to describe the glass. The colourful pieces are interesting, but the pieces that intrigue me the most are the thick dark almost black chunky pieces .. why you might ask? my answer is simple, I can't imagine where this glass came from. I have visions of shipwrecks from many years ago and the possibility that the piece of glass that I'm holding came from one of them. Donna Morgan is a graduate of the Sheridan College of Art in Oakville, Ontario Canada. She now resides on the Caribbean island of Barbados. 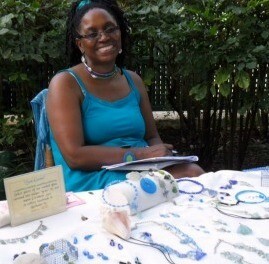 Her love of fashion, lead her into designing accessories and jewelry. Her inspiration comes from many sources especially the wonderful blue waters of the Caribbean and our soft white sand beaches. Using silver wire, semi-precious stones, crystals, leather and other natural items she creates unique pieces of jewelry which also can be considered art. 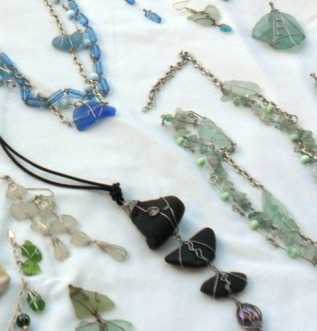 Her newest collection include designs using natural sand washed beach glass for a twist on recycling and torch worked glass pendants. All of her pieces are individual and one of a kind each piece of jewelry is created in her West Coast home studio. She can be contacted for a private look at her latest collection.